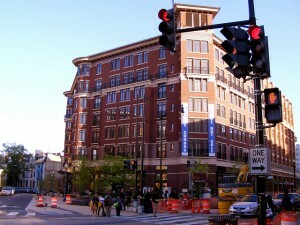 Kenyon Square in Columbia Heights is where affordable condo owners are facing escalating fees. When big condo buildings and luxury developments are built up in gentrifying neighborhoods, a common fear arises: low and moderate-income residents won’t be able to afford to stick around. Reserving affordable housing in gentrified neighborhoods seems like an obvious solution to such displacement. That was the thinking behind the District’s Affordable Dwelling Unit program, in which developers set aside some condo units at below-market rate for people with lower incomes. The program is intended to make it possible for people with moderate incomes to remain in gentrifying neighborhoods such as Columbia Heights. An issue the program doesn’t address is condo fees. While the program has kept mortgages down, it doesn’t have any restrictions on condo fees. Some affordable unit owners have seen their condo fees double to $400 or $750 and fear foreclosure could be imminent. “It identifies a real problem… despite our best efforts to do the right thing,” Councilman Jim Graham said. He represents Ward 1, which is where many of these buildings are located, such as Kenyon Square. Since 2008, condo fees there have doubled to more than $400. Manna Inc.‘s housing advocacy team has taken up the unit owners’ cause. They’ve submitted a petition to D.C. Councilmembers last month, urging them to start thinking of solutions. Condo fees cover common building costs, such as maintenance and repairs. All unit owners have to pay them. A board made up of unit owners typically set fees. Affordable unit owners make up a small portion of these buildings; for instance, there are only five affordable units out of 107 total in the Chase Point condo building in Friendship Heights. The market-rate for units at Chase Point start at around $600,000. One affordable unit owner unsuccessfully ran for the condo board of City Vista in Mt. Vernon. There is now talk at the building of installing a dog park on the roof, which would be an additional expense that could increase condo fees, Scruggs said. Some of these improvements can increase the value of the property. But according to the program, affordable condo owners are restricted from selling their units for 20 years, unless it’s to someone else who’s in the same income category, which can be difficult when condo fees are too high. Owners also can’t tap into the equity of their condos for 20 years. “We’re in a bit of a jam,” Graham acknowledged. Scruggs said the city needs to provide permanent subsidies to help affordable unit owners pay for increasing rates. But that would require city dollars, a tricky proposition especially in these difficult economic times. An alternative solution is setting a cap on how high condo rates can rise for affordable unit owners, but other condo owners who would be paying more for the same amenities could view that as unfair. Also, it’s unclear even to lawmakers how many people this issue affects. Graham said the city’s Department of Housing and Community Development should begin a review of the program. This is a very pressing issue right now. As someone who works in affordable homeownership, I’d like to add that an alternative to permanent subsidy from the City would be for the City to allow affordable owners to get out of the situation by peeling back to 20 year resale restriction and allowing folks to sell to others in higher income categories. This is especially important for owners who have extremely high condo fees. Another solution would be for the District to allow these owners to rent out their units at a price that covers their monthly unit costs. And as far as the condo fees, perhaps the City could allow affordable owners to dip into their restricted equity specifically to pay for part of their condo fees. Another note, the ADU program would probably be more successful if the District focused only on all affordable unit buildings (there are many of these) in gentrifying areas, or buildings where the affordable owners are over half of the building and all of the owners understand the mixed-income situation they are living in. I personally don’t want a ghettoized city, and the previous suggestions would make sure that doesn’t happen. The current situation is one where many lower income people can’t afford “affordable” condos in the long term and are resented by higher income folks in their building; and if the City doesn’t do anything to address the situation, these affordable owners will be displaced. So the Realtor, homeownership agencies and banks never forewarned these folks of the inevitable rising fees? That is usually the first caveat for most first time condo homeowners? Wouldn’t an education about condo fees PRIOR to purchasing better serve the affordable buyer, market rate condo owners and the real estate agents? Why is this a surprise? Why didn’t anyone give the affordable buyer a comprehensive view of what condo fees mean for the duration of homeownership? Someone dropped the ball and now we are right back at square one. I find that these “displacement” mechanisms usually keep people in cycles of dependency instead of giving them the information and analytic tools to decide if they want to buy into a condo association that values rooftop dog parks over low condo fees. From renter to homeowner to foreclosure back to renter, the cycle continues. Just make the condo fees the same as the ratio of what they are paying for the unit compared to the market value. So if they’re paying half the market rate for the condo, they pay half the condo fees. The number of affordable units in these buildings is small, so the difference in income to the property won’t be very large. It’s already set up that way. They aren’t paying the full fees, they are paying a portion of them. this is not true. I am an ADU owner in DC and I pay full condo fees. I believe all of the ADU owners in my building pay full fees.